I know what you’re thinking, because it has been on my mind too. *Sigh. * Oatmeal Raisin is a waste of a cookie. I said it. You think you’re going to sneak your teeth into a gooey chocolate chip, and then you let out a wail of utter disappointment when they hit a chewy raisin instead. Don’t get me wrong, I am all for fruit and more fiber, but when I go for a cookie and see something dark in it, it better darn well be chocolate. 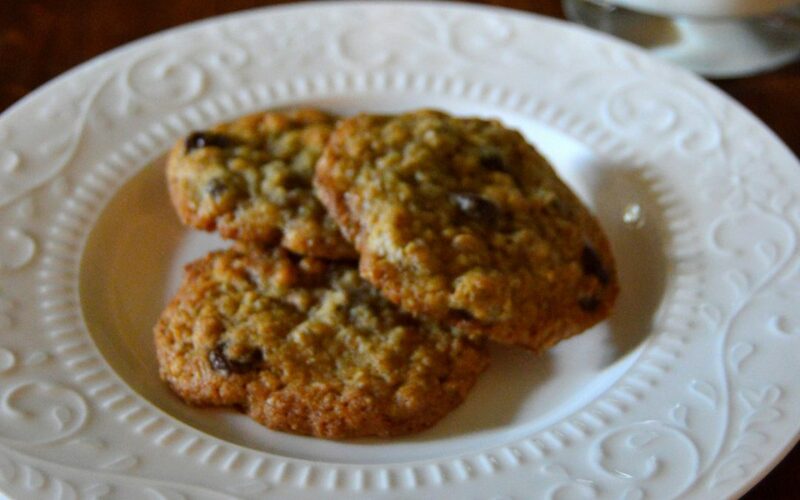 Oatmeal and chocolate chips make such a wonderful combination in a cookie, and they are my absolute favorite. So if I’m going to enjoy a delicious cookie, why not make it worth the calories by packing some extra beneficial nutrition into it? Before you get the image of a hockey puck “health” cookie in your head, hear me out. Ground flaxseed is an excellent way to sneak some nutrients into your baking. If you’re new to flax, know that aside from it being a good source of fiber and vitamins, it is rich in the plant source of omega 3, alpha-linolenic acid. Flaxseed is what they feed chickens whose eggs are advertised as higher in omega 3 fatty acids. About 1 tablespoon of flaxseed has about 1.8 grams of plant-based omega 3, and it is one of the oldest grains around, known to date back to Ancient Egypt times. King Charlemagne of the 8th century was known to be a big enthusiast of flax too, making his loyal subjects eat it. They were all on to something, because modern science has revealed its benefits, include lowering of cholesterol and your risk for heart disease, diabetes, and as some studies indicate, certain cancers. If I can get those benefits without sacrificing taste of an awesome cookie, why not throw some in? I mean, it’s fit for a freaking king and it’s right there at the grocery store. I will emphasize the importance of using GROUND flax seed in baking. If you buy whole seeds, you might not get the same health benefits because your body passes it without absorbing any of the nutrients. Plus, I’m not into really seedy cookies. So if you’d like to give flax a try, this is a great recipe to start with. You get benefits from the oatmeal, the flax, and dark chocolate. And while I can’t say this is a low calorie “health food”(it still has sugar, butter, etc.) it is a smarter way to enjoy a treat once in a while. Just remember, it is a treat, and should be treated as such. This recipe makes a lot, so you can share. 1/4 cup ground flax seed. 2) Using a stand mixer or hand mixer, cream together butter, sugar, and vanilla. 4) Sift together flour, baking soda, and salt together in a small bowl, then add to cookie mixture, blend. 6) Refrigerate dough for at least a couple hours, or overnight. 7) Preheat oven to 375 degrees. 10) Let cool (can use a cookie rack to prevent overbaking) and enjoy! Do you have a favorite flax recipe? Please share!